Cartier 18k tension set blue sapphire ring. Size 6.75. This Cartier ring is currently size 6.75 and some items can be sized up or down, please ask! It weighs 6 pennyweights and is 18k. Cartier Tahitian black pearl & diamond ring in 18k white gold. 1.20ct in pave diamonds. Cartier cabochon moonstone ring in 18k white gold. 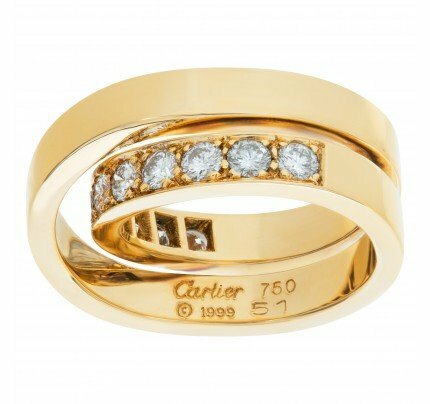 Elegant Cartier Panthere link ring 18k yellow gold with diamonds. Cartier GIA certified 1.01cts round brilliant cut center diamond (F color, Internally Flawless clarity, Excellent Cut, Excellent polish, Excellent symmetry) engagement ring in platinum. Cartier Trinity ring with 0.18 carat in diamond accents. Size 54.